We are delighted to present a portion of Matthew Hogan's Scholarship Application (reprinted with permission). 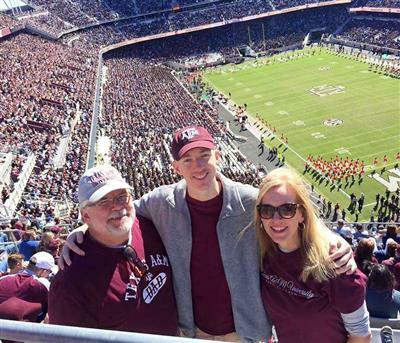 Matthew is a former BMTU patient who attends Texas A&M University and is majoring in Mechanical Engineering. His Grace Foundation is honored to have served Matthew and his family during their time on the BMTU, and to continue to be a part of their journey through the His Grace Foundation Holly A. Hardy Educational Support and Scholarship Fund. Question: How has your fight for life influenced your plans for college and/ or the future? My experience with cancer has been very influential for me and has caused me to mature and grow in ways only an experience like this can. My life goals have been altered as well as my career goals have shifted because of this. lt has caused me to look at the world and others more positively and with less criticism than I used to, and has made me want to give back to those going through a similar experience as mine both in and outside of my future career. their life, so to say that in effecting my life values cancer has strengthened and changed me as a person would absolutely be true. My life values have always been based on my Christian faith so in going through this experience I have focused more on my faith than ever before. it has been so vital to have something to turn to when times are tough. Because of that, the life values of family as well as loving and being kind to others have always been important to me but through this experience have become only more important and part of who I am. I have been blessed to have family and friends to lean on and draw closer to during this time. The way in which my life values have changed has been that this experience has made me think much more about giving back and helping out with my new experience and knowledge. I have been shy and reserved most of my life but this experience has allowed me to open up and connect with people that I would not have been able to in the past. Also, there are so many important and helpful volunteers who I have met during this that have shed a light on how wonderful it is that former cancer patients, who I believe have the most to offer the other patients and families in terms of helpful information, do give their time and help those in such a similar place as they were. I hope once now that I have cancer in the rearview mirror that I will be able to help others as I have seen people do. Also because of my experience with cancer my career goals have been altered. I now know that I would like to help the cancer community and research through my future work in the engineering field. lt would be wonderful to help out in the field of work I enjoy. That is why I would like to help develop new technology as well as use the success of my career to give back in the most helpful way I can. Whether that means working with medical equipment companies and or being part of a foundation that gives back to the community, I am still unsure of, but I now know that I want to give back because of my experience with cancer. There has been a lot of innovation and research that has been so helpful to me while going through this and I would love to help further the new frontier of techniques to help with the success and quality of care provided. My experience with cancer has impacted me greatly. It has both strengthened and changed my life values as well as it has altered my career goals for the better. lt has made me want to give back in the ways I know how and help others like I have been helped. "College is going fantastic. I am now a biomedical science major, and I love the course work, I think in part because of my personal experience with medicine. Also, I have been getting more and more involved in the local church in College Station which has been the highlight of my whole college experience so far, just getting to grow closer to God and serve others in such an awesome community. A&M has been such a great place to live and learn and ultimately earn my degree from; also how about that Aggie football! After college, I am very excited for how I will get to use all that I have learned, to be of benefit to my local community and hopefully the world at large, by pursuing a career in public health and likely going on to get a masters in public health. I would love to see the public better equipped and educated on how to live a healthier lifestyle and abroad I would love to see a significant reduction in deaths by infectious disease. So there is a lot to look forward to, and I am so thankful to be alive to see those things happen."